Last week I made this delicious broccoli slaw. I went to post it and just as I was clicking the PUBLISH button, I saw that Debra from Smitten Kitchen ALSO had just posted a broccoli slaw! What are the chances of that? It's not like we both made a linguine with clam sauce, it was a BROCCOLI SLAW. Not the most common thing, and it was minutes apart from each other's posting. I often do that. I click on one of the blogs that I read, and I see something I just made! (Pam & Lisa! ), so I wait a few days to post it, so the recipe is fresh in people's minds. I decided to wait to post this recipe, because I didn't want anyone to think she copied me! It was very good, and now that it is closer to summer, it is a refreshing & different way to serve cole slaw. ......And my recipe is totally different from Debra's recipe! Whisk the dressing ingredients together in a bowl and adjust flavors to your liking. You may like a creamier texture, or maybe more vinegary. Pour your dressing over the first 4 ingredients and mix together. This tastes even better after being in the fridge 24 hours! This slaw has most of the major food groups - which must be why it's so popular! Oh, I'm going to look for that packaged slaw at TJs. Sounds great, and summery. I've never had broccoli slaw but this sounds great for a warm day. We're getting a TJ's here in Princeton this summer! yea! 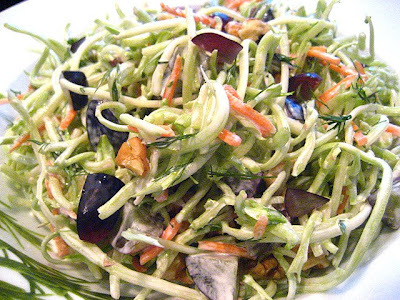 I am loving this slaw and the flavors you used. It looks really delicious! Your chicken with figs down below looks amazing too. It looks fabulous! I had broccoli slaw in my hand last weekend and then I put it back because I wasn't sure. Maybe I should try it! Delicious slaw. I am not to fond of the cabbage slaw, but this one win me over. Yummy! I buy pre-shredded broccoli slaw all the time, for my husband to add to his daily lunch salad. Sometimes I make slaw with it. I like your version a LOT! BTW, I found out that we Californians do have Hellman's under the name of "Best Foods" mayo. Who knew? There is a bit of irony in this post. I made a dish with broccoli the other night (on my blog now) where I spent the extra money on pre-cut florets because I only wanted the florets for the recipe. I actually thought to myself that if I saved the money and bought the entire stalks, I could shred the stalks and make broccoli slaw with them. I end up not doing that, and then I go to your blog and see a recipe for broccoli slaw. I guess I should have bought the stalks after all. 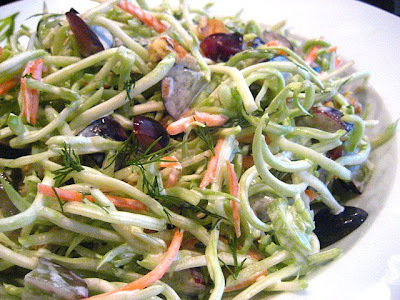 Haven't had a broccoli salad in a while, so this slaw looks great. This looks great! I haven't bought broccoli slaw in awhile, but I should because it's so good to cook with. I do buy this on occasion, have always liked it, and always used dried cranberries with mine.As usual, you have a great twist on yours with the grapes and walnuts!! Oh...I'm going to post a citrus version of a broccoli slaw. It was so fresh, light and crisp. Yum! That looks pretty damn good. Particularly with the grapes. Digging the slaw for summer... have you ever put julienned raw rhubarb in a slaw... I may have invented it, but I'm not ready to take out a copyright until I find out for sure. * Not sure if you noticed, but I'm just playing catch up with your blog (after a very hectic month) and you've been about as busy as the days are long... and you are totally in full on summer mode. I just made a Broccoli Slaw with pre-packaged Broccoli Slaw mix, Dukes Mayo, Pomegranate Red Wine Vinaigrette, Sunflower Seeds, Dried Cranberries and Golden Raisins...absolutely delicious! I can't wait to try it in the morning, after it's had time to "meld"...but so far, so good! Oh, I did sprinkle a little bit of sugar to balance the tartness of the vinegar, and I think that was a good idea.